Dee Why NSW	Need Insurance? 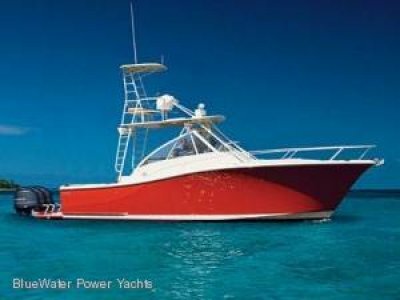 The 37 Open Tower replaces the ever popular 36 & 38 Opens in the Luhrs line-up and this new design is a giant leap forward in terms of design, economy, and ergonomics against any boat of comparable size. 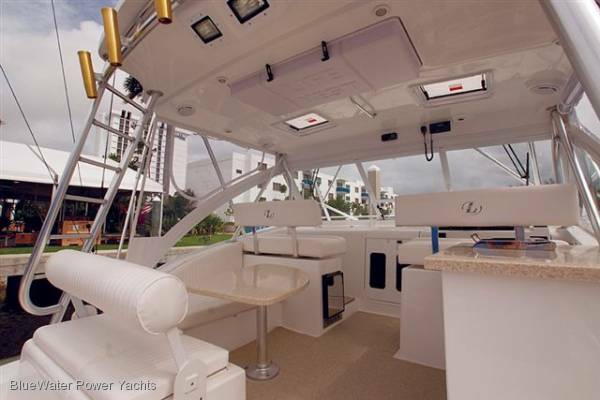 This is an Open Express style boat that offers the cockpit and manouvrability of a top line sportfishing boat, the space of an open express entertainment machine, and the accommodation of a flybridge convertible family cruiser. The best of all worlds. 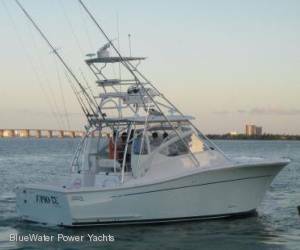 At 11.8m (38’10”) LOA and 4.4m (14’6”) Beam, this battlewagon is big where it counts, offering anglers all the essentials for blue-water sportfishing while providing the family with a luxurious weekender for cruising and entertaining in comfort & style. 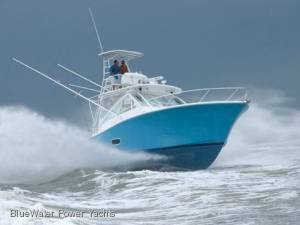 Like all Luhrs, the 37 Open is a superb sea boat with all the famous Luhrs deep v performance traits, a pleasure to drive, and incredibly good value for money. Into a head sea, button down the tabs so the deep v entry slices through the waves and lets the signature Carolina Flare throw the water aside for a dry smooth ride. Down sea the wide beam ensures a stable comfortable ride. Everything you’d expect from a Luhrs. The tower provides the skipper with panoramic views to spot working birds and fish coming into the spread. Dual station electronic controls allow full control in both tower and bridgedeck. Travelling in and out you can drive from the bridgedeck and enjoy the social camaraderie. 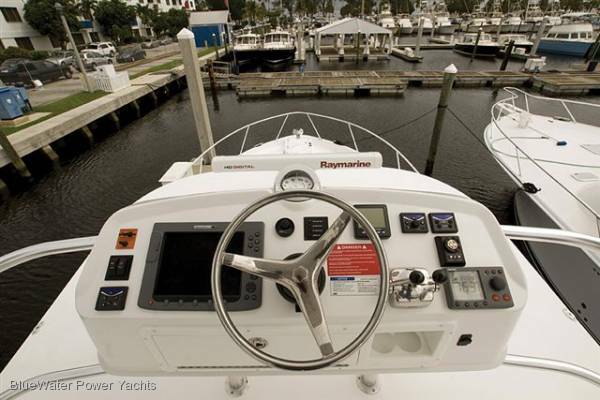 You’re not stuck on the flybridge all alone while the party is down below or in foul weather. The raised custom helm seat on the bridge ensures great visibility all round and the console dash will handle the largest of electronics. The windscreen has an electrically controlled opening section for ventilation plus an overhead hatch in the hard top. All standard. Down below, the interior is innovative and practical. There are 2 sea-berths in the main salon, while up forward there’s a queen-size berth. 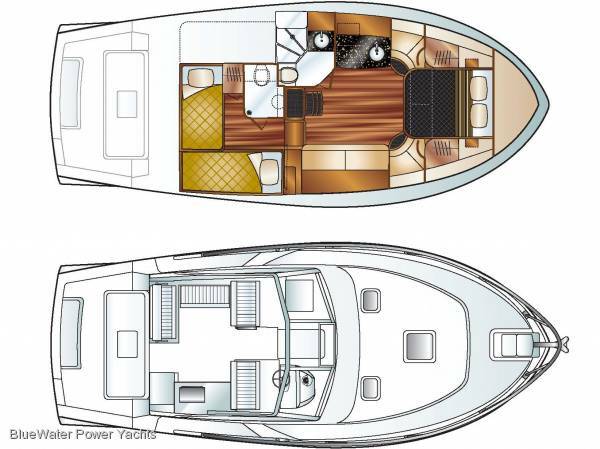 Unique to the 37 Open, there is a private cabin with 2 berths and either an optional extra toilet or full height rod & tackle storage locker. The galley has a s/s sink, Corian bench tops and twin burner electric cook-top, fridge freezer, and microwave, plus loads of storage space. The large WC has a separate shower stall and electric toilet with holding tank. All standard. 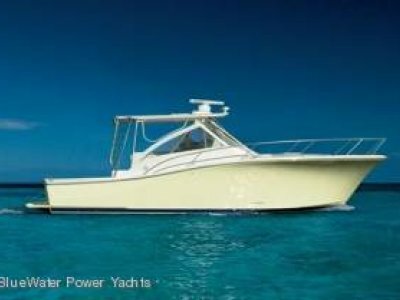 The 37 Open comes with 2x Volvo IPS-500 (or 600) diesel drives to give this boat the best possible performance, economy, and quiet running. All the engineering is heavy duty. 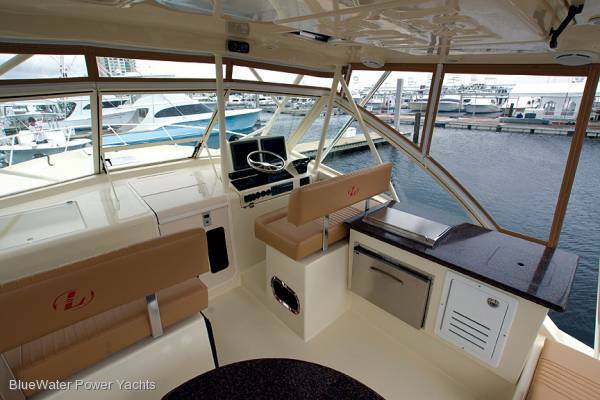 The large cockpit includes a transom livewell, moulded bait-prep station, tackle drawers and sink. 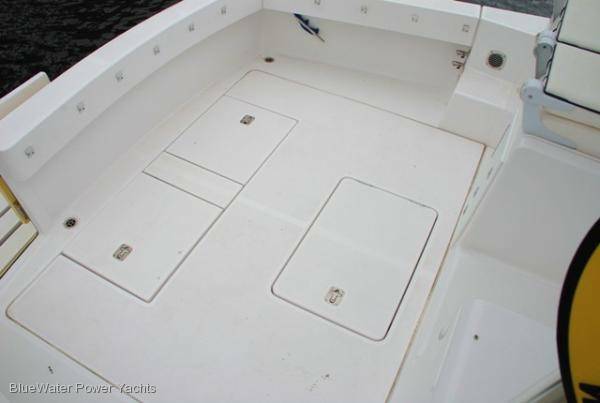 There are two large in-sole fishboxes, and huge insulated icebox. There’s an alloy plate moulded into the floor ready to take a full sized game chair, and of course a transom door to slide the big ones in. 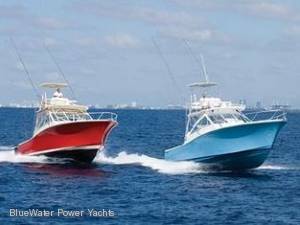 Please call BlueWater Power Yachts on (02) 9029 6554 or 0416 282 022 for full specifications and options. 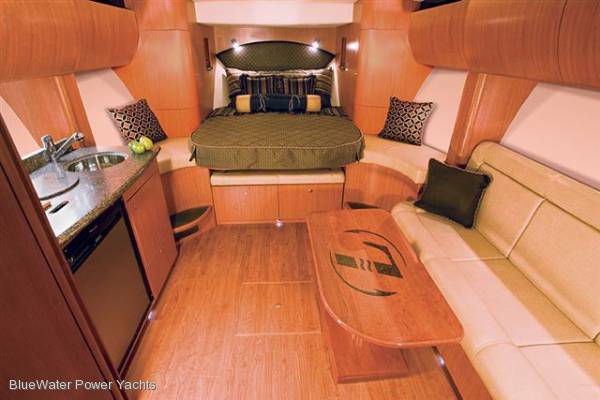 Queensize berth in bow, 2x sea bunks amidships, 2x singles in cabin under bridgedeck. 2x burner stove, s/s sink, fridge / freezer, good stowage. 12/240 v fridge freezer in galley, icebox in cockpit converts to fridge / freezer option. 6x life jackets, 2x fire extingishers, built in fire extinguisher in engineroom, gas monitoring systems. 2x bow cleats, 2x amidships cleats, 2x underdeck cleats aft. 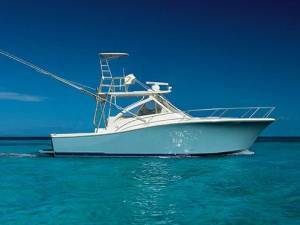 This is the sportfishing boat that many Australians have been waiting for. 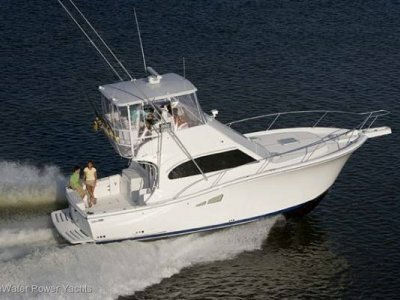 Big enough to fish with the battlewagons but small enough to be able to run economically and maintain easily. Australian Specification - 240v and gas compliant.